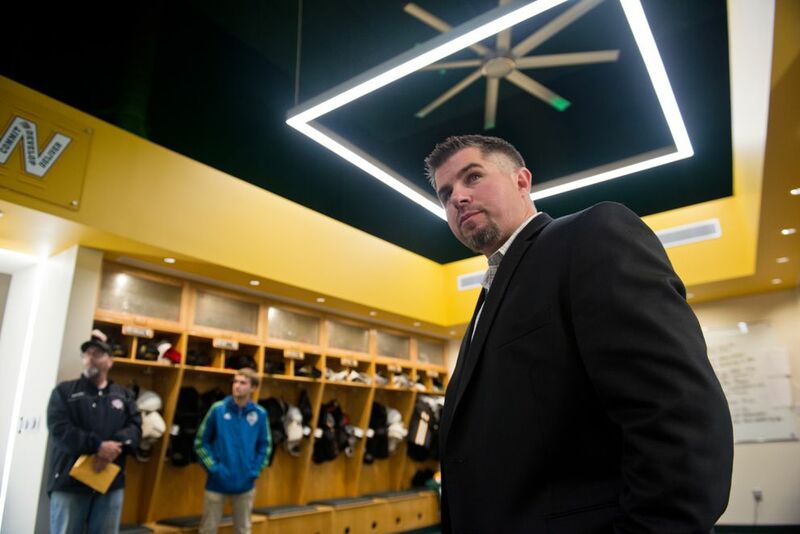 UAA hockey coach Matt Thomas, whose team won four of its 34 games this season, won't be back next year. The university isn't renewing Thomas' contract and will begin a nationwide search for a new coach soon, interim athletic director Tim McDiffett said Wednesday afternoon. 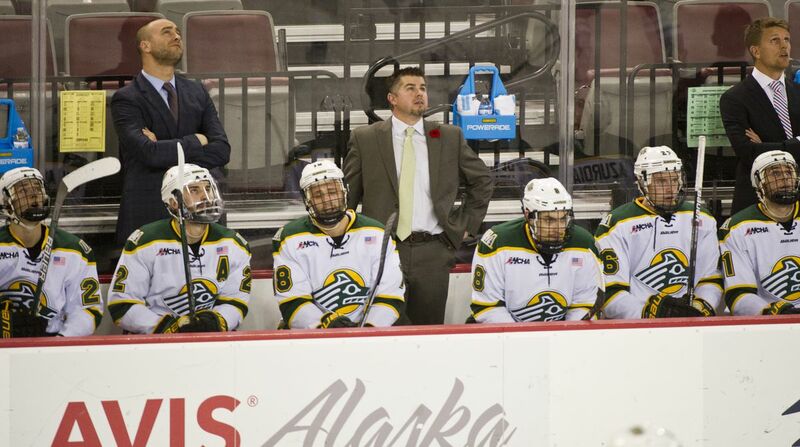 Thomas, who came to UAA after a successful run as an ECHL coach, was 48-105-21 in five seasons at UAA. This season, the Seawolves were 4-26-4 (4-21-3 in the Western Collegiate Hockey Association) and registered two of their wins on the final weekend of the season. "We just feel we need to be more competitive. We want to compete for championships," McDiffett said. "We didn't see the trajectory going in the right direction." Thomas, 42, enjoyed a nice honeymoon period with the Seawolves — he led them to an 18-16-4 record and sixth place in the WCHA in his first year. But after that came four straight losing seasons, including three in which UAA finished last in the 10-team WCHA. The most recent season was one of the worst in school history. The four wins rank as the second fewest and the 26 losses rank as the third most in school history. The 2002-03 team was 1-28-7, setting school records for the most losses and the fewest wins. The Seawolves finished this season on a winning note by beating rival UAF twice last weekend in Fairbanks. But the sweep of the rival Nanooks wasn't enough to save Thomas, who lost five consecutive Governor's Cup series to UAF. Fairbanks has won every Governor's Cup since 2010, although three titles during that span were vacated due to NCAA violations. McDiffett said the school believes the hockey program can be more competitive. "We are committed to hockey," he said. "The updates we've made on campus are significant. All (of our) sports face geographical disadvantages, but we think we have a lot of things in place to be more competitive than we have been. "We want to win the Governor's Cup, we'd like to host home ice in the WCHA playoffs and we'd like to get into the postseason. You play to be a part of a championship season, and certainly we've been able to do that in many of our other sports." Hockey is one of 13 NCAA sports offered at UAA and one of two Division I sports, along with gymnastics. Once the school's flagship sport, the Seawolves are long past the days of playing at a packed Sullivan Arena. Attendance has been waning for years, a trend that worsened under Thomas. Twice in the last three seasons, average attendance dipped below 2,000 at an arena that holds 6,206 for hockey. The Seawolves averaged 1,998 spectators per game this season and a program-worst 1,763 in 2015-16. This season's attendance ranked 44th among the nation's 60 Division I hockey teams. Of the teams that rank below UAA in attendance, seven play in arenas that hold 2,000 or fewer people. Thomas was the fifth hockey coach in UAA history and was in the final season of a five-year contract. His $200,000 annual salary made him the highest-paid employee in the history of UAA athletics. Thomas came to UAA after a decade-long run in the ECHL, where he was the head coach at Stockton, Fresno and Atlantic City. He replaced Dave Shyiak, who was fired in 2013 after eight straight losing seasons. He was not available for comment Wednesday. McDiffett said the search for a new coach will begin soon. "We know time is of the essence and we want to provide stability for our student-athletes," he said.